There was a documentary on the suffragettes on the BBC a few days ago and with it being 100 years from the granting of (limited) women’s suffrage, it seemed appropriate to break out of the eighteenth century a moment and post this. No Surrender is one of very few novels written by a participant of the movement. I was worried at first - the initial chapter is set in a fictional Lancashire town with a group of characters talking in a stagey Lancashire dialogue. I’m not a fan of complaining northerners at the best of times, but the twenty pages of ‘oop gan em on t’mill’ felt interminable. Luckily, the action moves down south. Although it is a polemical work, it also managed to be comic at times and harrowing at others. 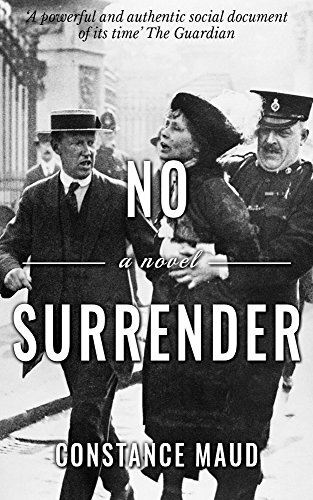 I watched the 2015 film ‘Suffragette’ immediately after finishing the book and although No Surrender and that film shared a sense of women joining as part of a cause, this book highlighted a sense of joy and playfulness. Constance Maud was chiefly a novelist of farce, and this plays best in scenes where suffragettes sit in a church in suffragette colours and freak out a group of cabinet ministers, or when they crash a posh dinner party. It was fascinating hearing the arguments of the suffragettes and the anti-suffragettes. It was also interesting to learn about the suffragists, who were the less radical wing of the ‘votes-for-women’ brigade. It was clear that those against the votes were worried about women as an unknown quality - and that the women thought the vote would be the key to solving all women’s oppression. From a period, just over a hundred years later, when women have received the vote but not solved the inequality - there’s both a hope and sadness that comes from the desires of the women in their cause together. The earlier scenes in prison were unpleasant, and the later ones more unpleasant still, yet the fire of purpose and the community of fellow sufferers raises those horrible scenes. Yes, the women are humiliated, strapped down and fed Bovril through their nose - but the last chapter, where the women march past together, makes it seem that they endure for a reason. Those dreams are not fully realised a hundred years later, but I think Constance Maud would look at the world with a much needed jolt of positivity.